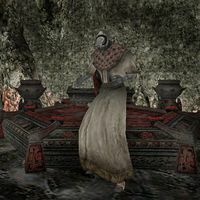 Oddly, Dagoth Fovon is a merchant, though he has nothing much to sell and no gold with which to buy anything. However, he does offer repair services at base-cost, which you can take advantage of if you sneak up on him or cast Calm Creature to stop him from attacking you. This page was last modified on 10 March 2018, at 23:58.